Performing the following operations when carrying the electronic key on your person starts the engine or changes engine switch modes. Release the brake pedal and check that the smart key system indicator light (green) is off. The smart key system indicator light (green) off. The smart key system indicator light (green) flashes slowly. Check that the smart key system indicator light (green) flashes slowly and then press the engine switch once. If the vehicle is left in accessory or ignition on mode (the engine is not running) for more than an hour with the shift lever in p, the engine switch will automatically turn off. However, this function cannot entirely prevent battery discharge. 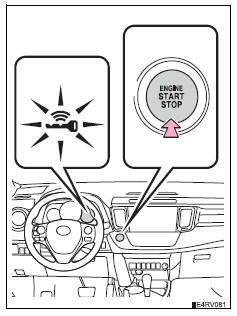 Do not leave the vehicle with the engine switch in accessory or ignition on mode for long periods of time when the engine is not running. The engine immobilizer system may not have been deactivated. („_P. 76) Contact your toyota dealer. The steering lock may not have been canceled. The smart key system indicator light (green) will flash quickly. In this case, refrain from running the engine. After about 10 seconds, the steering lock motor will resume functioning. If you want to stop the engine in an emergency while driving the vehicle, press and hold the engine switch for more than 2 seconds, or press it briefly 3 times or more in succession. However, do not touch the engine switch while driving except in an emergency. 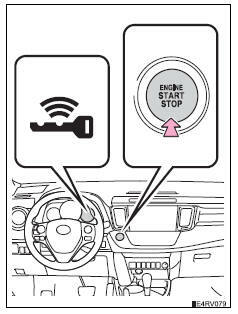 If the smart key system indicator light (green) is illuminated, the engine switch is not off. When exiting the vehicle, always check that the engine switch is off. If the engine switch seems to be operating somewhat differently than usual, such as the switch sticking slightly, there may be a malfunction. Contact your toyota dealer immediately.